Were rockin balls over here. Ok, I really don’t know what that means, but it was fun to say. 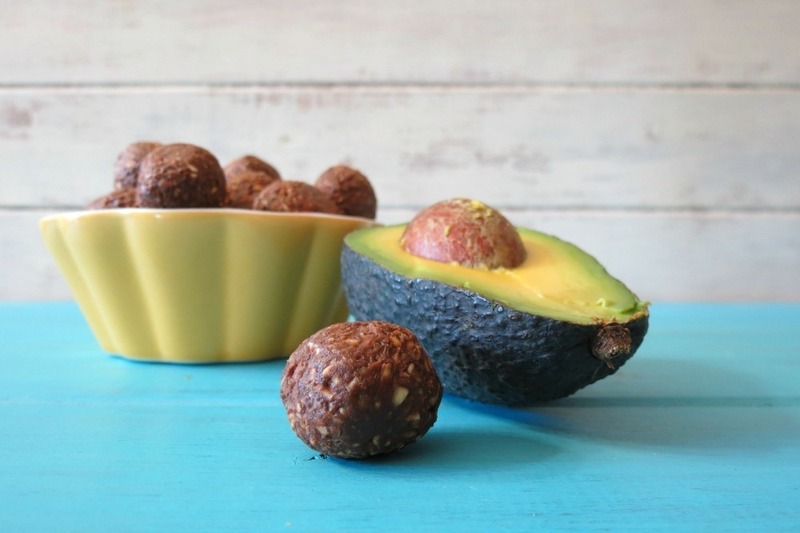 Today I have another no bake, raw cookie dough ball recipe for you, using one of my favorite fruits, avocado. I have an abundance of avocados in my house and me being the only one who eats them, I can’t eat them quick enough, so I needed to find use for them, that would last longer than an over ripe avocado. So the Avocado Chocolate Balls were born!! 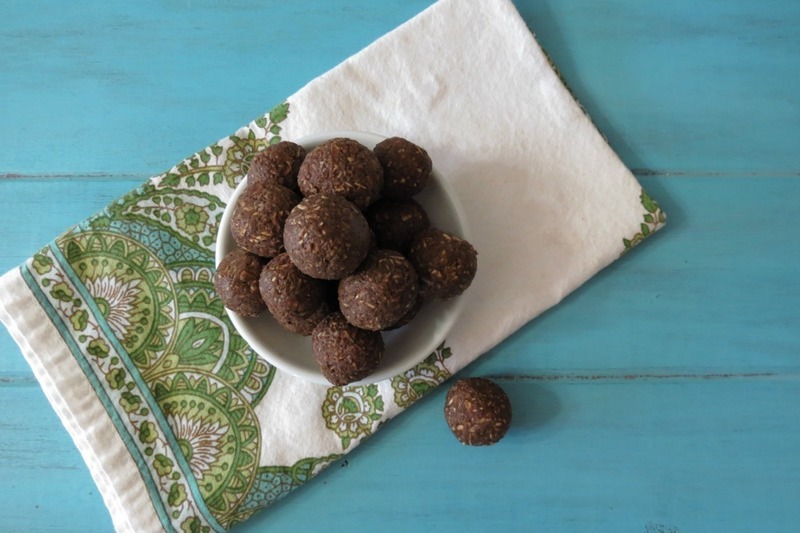 These balls are rich, creamy, a pinch salty, low-calorie, gluten-free and vegan and so perfect for chocolate cravings!! I used simple ingredients so everyone can make balls!! After all, balls are fun to make! I know I like to say balls a lot. I’m a total weirdo!! I’m fine with that! 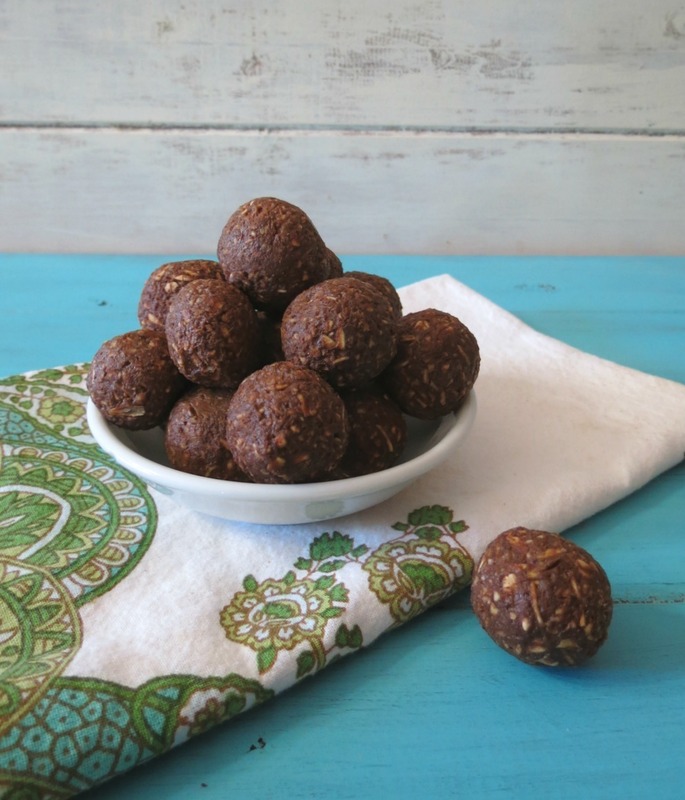 When making these balls I debated on using coconut or peanut butter, but I really wanted to stick to one kind of healthy fat and the rest a healthy carb. To hold it all together, I used gluten-free rolled oats from Trader Joe’s. Add a pinch of brown sugar, vanilla extract, stevia and of course cocoa!! The combination is heavenly. 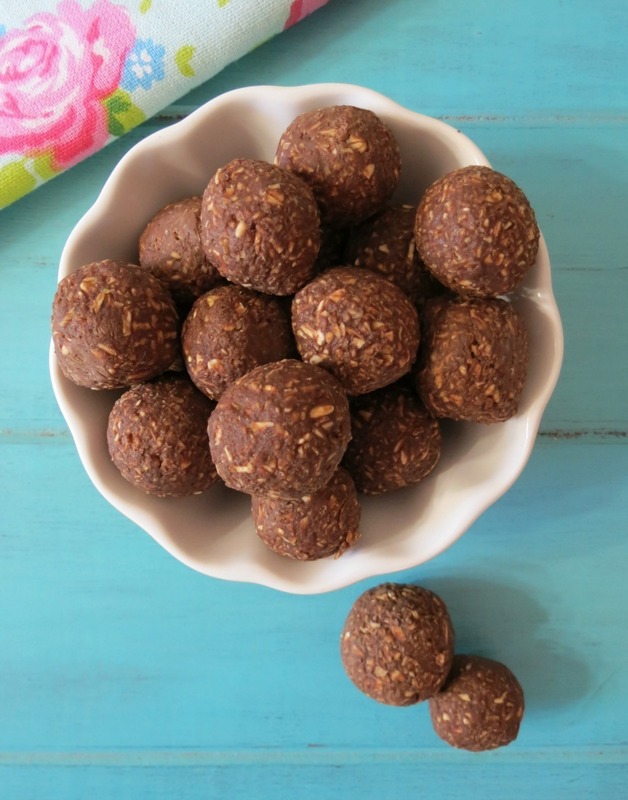 The little dough balls almost taste like a big chocolate chip to me, but WAY healthier! Each ball comes in at only 21 calories! Guilt-free, perfect and I’m happy! 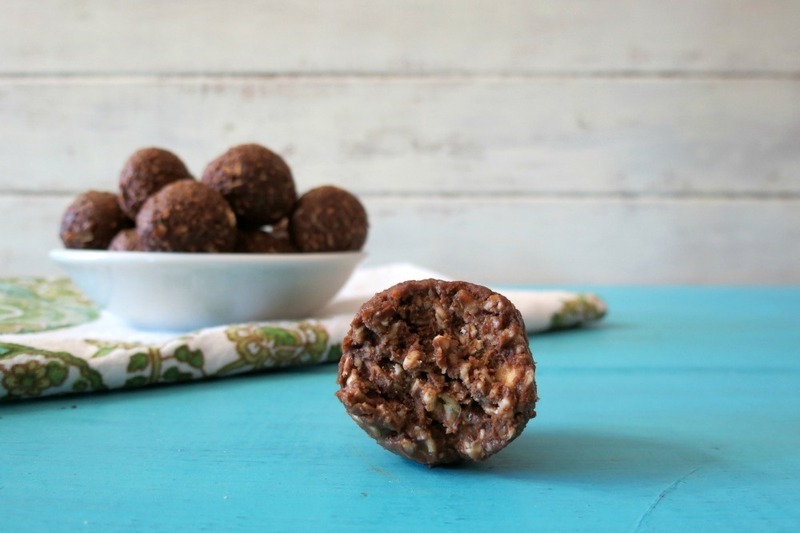 A vegan and gluten free, creamy, chocolaty, raw dough ball made with avocados and chocolate. In a bowl mashed your avocado, I used a back of a spoon. Mix in cocoa powder, brown sugar, salt and vanilla extract. Mix until well incorporated. Taste test it, to see how much stevia you want to use, I used two packets. Add oats; mix well. Take about a tablespoon size of batter in your hands and roll into a ball and place on prepared baking. The batter will be soft. If you feel the batter needs to be more firm; add a pinch more rolled oats or even almond meal or shredded coconut. Place the baking sheet in the freezer or refrigerator for at least 30 minutes. Once frozen or harden; place your balls in a container, I used a ziplock freezer bag. I stored mine in the freezer, but you could also store it in the refrigerator. If you freeze them, let the balls sit out for about 3 minutes before eating, to get the pure creaminess. Note: To make oat flour; place 1 cup of oatmeal in a food processor, I used my mini and process until flour like consistency. One cup oatmeal, makes one cup oat flour. I have to tell you something funny. On Sunday night, my Husband made my old recipe for macaroni salad. He has been begging me to make it for a week. I told him no, it’s to fatty, I can’t have that and I don’t feel like making that. So he went out, bought all the ingredients and made it himself. Of course he was asking how much of this and that goes in it. I told him! I decided to take a picture of it and put it on Instagram. He said, don’t do that, I put too much paprika on top, it’s not going to look pretty. I had to laugh, he actually cared about the presentation to his food. One day, I’ll get him to write a post or at least dictate one to me. But I promise you, whatever he makes will not be healthy! Go out and have a ball today or you can make balls! 🙂 Have fun and have a super bouncy day! Jennifer – Would this be a medium-size avocado? Is the weight for a whole avocado with skin and no pit or is it just the avocado meat? Thanks so much. Sound like a delicious and healthy way to eat chocolate. “rockin balls”. LOVE.IT. You cracked me up this morning! And you also made me hungry. THese look fabulous! Yummmm! Avocados are my favorite food! I’m always looking for a new way to use them – this is genius! Thank you Marie! I needed to find different uses with it, I have so many of them. I tend to go over board on buying them. Only 21 calories? I would be nibbling on these all day long, a really fun, unique treat Jennifer! Thanks Sophia! I need nutritious when my snack attack hits in the afternoon! Jennifer, I think I’m in love with these balls. hehehe. It IS fun to say it. But seriously, you’re the only one in your house who eats avocado? You’re sort of lucky, because you get to eat it all. But the rest of your fam is missing out. Oh well, their loss, right? You are so creative! These look fantastic! These look awesome and easy to try! I’m wondering, how necessary is the oat flour? Do you think it could be substituted 1:1 with coconut or almond, or shredded coconut? Hey Im just wondering if its necessary to process the rolled oats? Or could they be left as they are? I am not sure to be honest, I would think it would work without processing them, I’d say sample it out on a few tablespoons of dough, just to see how they hold together. made these once before and they are delicious. this time, i was thinking about adding some chocolate protein powder to these. i think i could leave out the stevia, but do you suggest cutting back on the oats a little? I made these tonight, they are in the freezer. Looking forward to trying them! I have to say, though, that I made them the size of a green grape, and there’s no way I got 30 ball out of one batch. Next time I’ll make them more a little smaller than a golf ball, and will probably end up with 6-8 balls. Thanks anyway. Great recipe and I’ll definitely make it again. Yeah, I tend to make everything small. I am glad you liked them. Enjoy!